With Season 3 of Jersey Shore kicking off January 6th, why not kick it off with a review of Snooki's debut book 'A Shore Thing'. I have to admit that Jersey Shore is a guilty pleasure of mine, and when I heard that Snooki was coming out with a book I thought "Really?". But then my curiosity got the best of me and I decided to step out of my little reading bubble and give it a try, and I'm happy I did. This book definitely surprised me. I was expecting 290 pages of a Jersey Shore episode but it offered so much more. I read this book right after reading a heavy book so the light read was very refreshing. It is packed with humour, hilarious scenarios and great one-liners. There was a specific scene at a house party that involved Snooki and a "Juice head Gorilla" that had me laughing so hard I was choking. The Book is fictional but you can't help but connect the main character Gia to Snooki. They both share the same corky, free spirited personality all in a pint sized body. 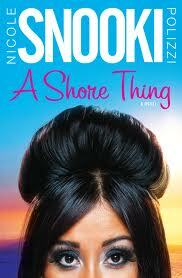 A Shore Thing was a great light and breezy read that I would definitely re-read on a beach or patio again some day. There was the obvious partying scenes and wild escapades that you would expect from a Summer in The Jersey Shore but the book was also packed with a loyal and unbreakable friendship between Gia and her cousin Bella. There were heartfelt moments, scary moments and hilliarious moments. This book definitely took me by surprise. Even if your not a fan of the Jersey Shore, I would still recommend this book. It's light, fun and perfect to read under the sun.